Benoit Hamon described his meeting with Germany's chancellor Angela Merkel as amiable, but not without differences. Benoit Hamon, the Socialist contender in France's presidential race, criticised Germany's handling of the eurozone crisis during a visit to Berlin on Tuesday (28 March). 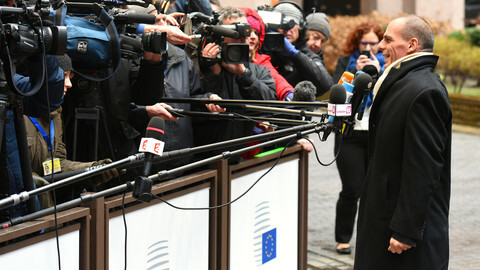 Hamon spoke to reporters after a meeting with German chancellor Angela Merkel. He described the meeting as amiable, but not without differences. 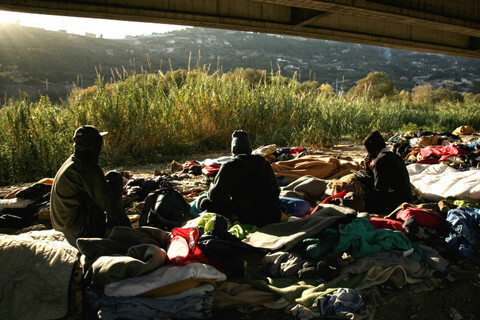 "I repeated to her my disagreement with austerity policies, the consequences that they have had on people, the fact that they have produced today social desperation that produces votes for the far right," he said. He said that Merkel disagreed with his analysis, but that she had not closed the door on his proposal for a reform of eurozone governance. 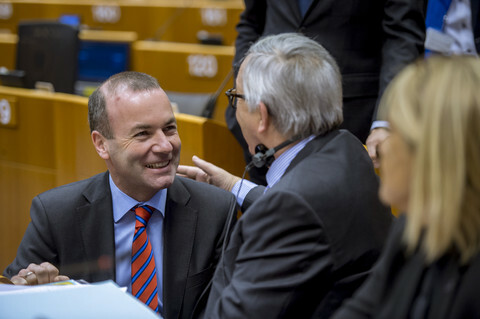 The proposal suggests to replace the Eurogroup - an informal gathering of eurozone finance ministers that is not enshrined in the EU treaties - with an assembly of politicians from national and the European parliaments. Hamon said they had agreed on the Minsk ceasefire deal, which aims to stop Russian-controlled forces from waging war in eastern Ukraine, and the need to strengthen EU defence. 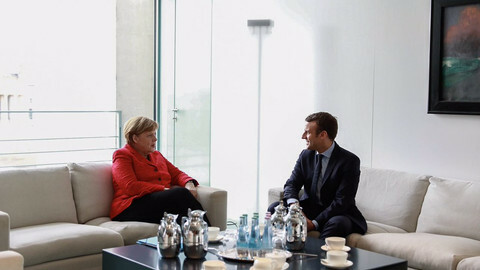 Merkel did not comment on the meeting. The German chancellor has previously met with centre-right and centrist presidential-hopefuls Francois Fillon and Emmanuel Macron, and said she would meet all candidates except for the far-right's Marine Le Pen. 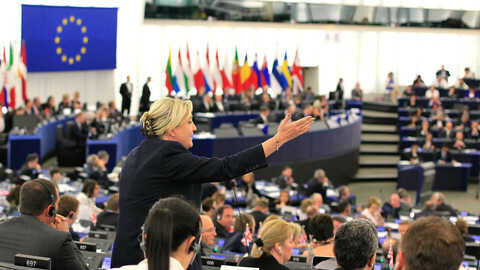 According to the latests poll published on Tuesday, Macron and Le Pen are neck-and-neck in the race for the first round on 23 April, with 25.5 percent and 25 percent of the voting intentions each. Fillon, whose wife was put under formal investigation on Tuesday in a "fake jobs" inquiry, was credited with 17.5 percent of voting intentions. Radical leftist Jean-Luc Melenchon had 14 percent and scored better than Hamon, who trailed with 10.5 percent of the poll. The socialist candidate, who was elected in a primary vote, is struggling to secure even the support of his own party. Many socialist heavyweights have bet on Macron instead. Former prime minister Manuel Valls became the latest socialist to break party ranks and announced on Wednesday morning that he would vote for Macron, adding that it was a "question of reason". 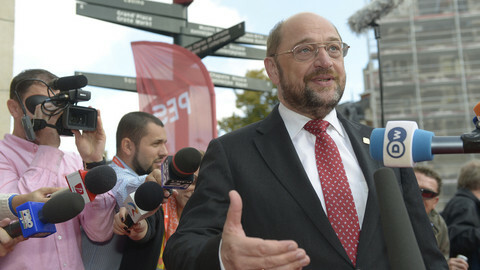 Hamon was endorsed by Martin Schulz, the German social democratic party (SPD) candidate for chancellor, on Tuesday. 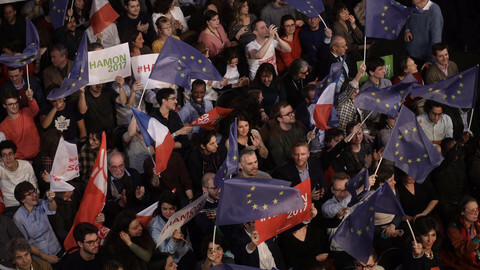 The former president of the European Parliament said he had "long wished Benoit Hamon success in the presidential race in France" and that he had the support of socialist parties across Europe. 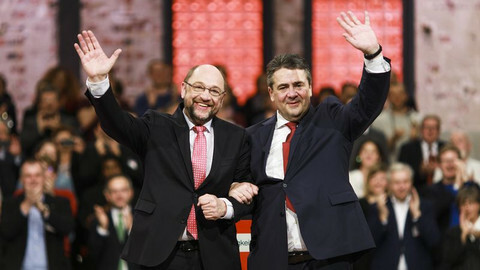 Earlier this month, while handing the SPD leadership over to Schulz, vice-chancellor Sigmar Gabriel had suggested that the party supported Macron instead of Hamon. "Imagine that Emmanuel Macron becomes president in France, and Martin [Schulz] chancellor. [Imagine] all the things we'll be able to change," he said. Martin Schulz, the former European Parliament president, is having to think up new approaches to overcome his recent drop in popularity.